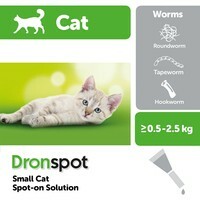 Dronspot Spot-On Worming Solution for Small Cats is a simple spot-on to fight intestinal worms in a single easy application for cats weighing >0.5 – 2.5kg. Roundworms and Tapeworms are the two main types of intestinal worms that affect cats in the UK; the symptoms of which aren’t always easy to spot. Using Dronspot when signs occur or at least every 3 months (depending on pet’s lifestyle), will reduce the likelihood of your cat being affected. No more struggling cats, no more stressed out owners, and above all, no more worms!